…but these are the biggies. If you keep up with these hashtags and handles, you will MORE than stay in the know! @CRMjen: (Yep, this is my Twitter handle) Not that my handle is necessarily a top ‘Twitter @Dreamforce’ resource, BUT I’d love to connect with you @Dreamforce and Twitter is a GREAT way to make that connection happen! #DFCoS: Official Dreamforce Circles of Success tweetstakes hashtag.You can win some pretty snazzy prizes (right up to a premium #DF14 pass) just for sharing packing tips. I mean, why even think about it? Tweet to win? Yes, please. #DF14NGO: For all things Nonprofit at Dreamforce 14, use this hashtag! 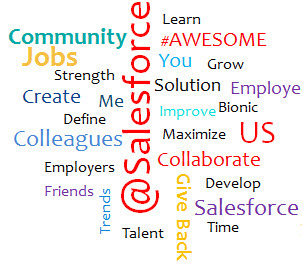 #DFHED: Stay in touch with the Higher Ed crowd at Dreamforce 14 by searching for and Tweeting with this hashtag. @SFDCFoundation: Official Salesforce Foundation handle.